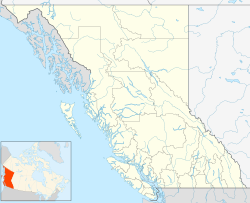 Motto(s): "By Sea, Land, and Air We Prosper"
Vancouver (pronounced /væn.ˈkuːvər/ (deprecatit template)) is a coastal ceety locatit in the Lawer Mainland o Breetish Columbie, Canadae. It is named for Breetish Caiptain George Vancouver, who explored the aurie in the 1790s. The name Vancouver itself originates frae the Dutch "van Coevorden", denotin somebody frae Coevorden, a ceety in the Netherlands. The Ceety o Vancouver wis ane o the first ceeties in Canadae tae enter intae an internaitional sister ceeties arrangement. Special arrangements for cultural, social an economic benefits hae been creatit wi these sister ceeties. 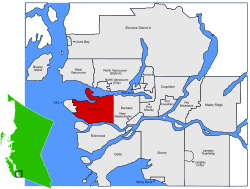 There are 21 municipalities in the Greater Vancouver Regional Destrict (GVRD). While each o these haes a separate municipal govrenment, the GVRD owersees common services athin the metropolitan aurie such as water, sewage, transportation, an regional pairks. ↑ "StatsCan 2011 Census for Vancouver CMA". 2011 Census data. Statistics Canada. Retrieved 9 February 2012. ↑ Davis, Chuck. "Coevorden". The History of Metropolitan Vancouver. Retrieved 2009-12-01. ↑ Smith, Patrick J. and Kennedy Stewart (2003). "Beavers and Cats Revisited: Creatures and Tenants versus Municipal Charter(s) and Home Rule" (PDF). Queen's University, Institute of Intergovernmental Relations. Retrieved 2009-12-01. ↑ "About Vancouver". City of Vancouver. 17 November 2009. Retrieved 1 December 2009. ↑ "Vancouver Twinning Relationships" (PDF). City of Vancouver. Retrieved 2009-12-05.